The Department of Culture and Tourism - Abu Dhabi (DCT Abu Dhabi) is set to lead a delegation of some of the emirate’s top tourism stakeholders, including tour operators, heritage and cultural attractions, destination management companies and the UAE’s national carrier, to ITB Asia, one of the world’s largest trade shows, to highlight the best of what the emirate has to offer. Boosting the emirate’s global profile further ahead of ITB Asia, which takes place in Singapore from October 17 to 19, was the news that Abu Dhabi has just won the top accolade at this year’s Travel Weekly Asia Readers’ Choice Awards, scooping first place in the Best Destination - Middle East category. 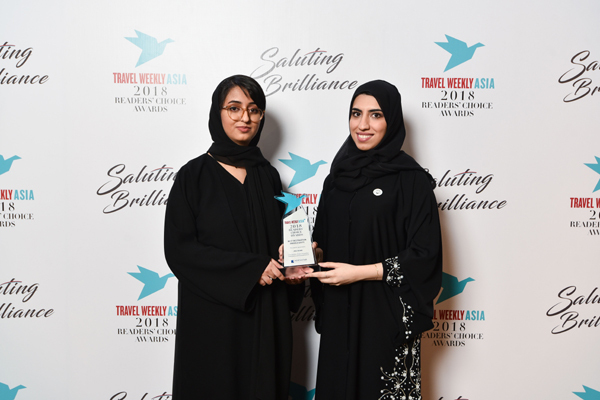 The 2018 Readers’ Choice award winners were presented with their trophies at a special ceremony on October 15 at the Mandarin Orchard Hotel in Singapore, with a representative from DCT Abu Dhabi in attendance to receive the award. Following the Travel Weekly Asia awards evening, the DCT Abu Dhabi delegation will be joined in Singapore by representatives of Sheikh Zayed Grand Mosque, the emirate’s most popular tourist attraction, which has been voted the world’s second popular attraction by TripAdvisor. Other stakeholders who will be present include representatives from Louvre Abu Dhabi, as well as Etihad Airways, Yas experiences, Hala Abu Dhabi and Nirvana Travel & Tourism. ITB Asia, now in its 11th edition, is organised by Messe Berlin (Singapore) and supported by the Singapore Exhibition & Convention Bureau. Held annually at Marina Bay Sands, the business-to-business trade show and convention takes place over three days and is widely considered to be the primary event for the Asia Pacific travel industry. This comes in parallel to the vast growth the travel industry in Southeast Asia is witnessing, and the UAE is primed to take advantage of this with gross bookings expected to reach $53.7 billion by 2020, a 22 per cent increase from 2016. Through the event, DCT - Abu Dhabi aims primarily to develop strong partnerships and marketing initiatives, which will act to reinforce Abu Dhabi’s reputation as a destination of distinction internationally and leverage its appeal, while building awareness around the emirate’s destination campaign.